Western Digital announced the WD Scorpio Blue 7mm hard drive, a new storage device for ultra-thin laptops and ultrabooks. Available in 320GB and 500GB capacities, these disks have a MSRP of $79.99 and $99.99. Western Digital® (NYSE: WDC), a worldwide storage leader, today announced it is shipping the WD Scorpio® Blue™ 7 mm hard drive, the latest addition to its mobile hard drive family and the 2.5-inch drive with the lowest power consumption on the market today. Specified to a best-in-class 400Gs shock tolerance, the new single-platter WD Scorpio Blue small form factor hard drives are available in 500 GB and 320 GB capacities and the drives' compatibility with industry-standard 9.5 mm slots make them ideal storage options for mainstream notebooks as well as slimmer notebook and Ultrabook™ devices that require a 7 mm drive height. "Consumers want thin and light personal computers, but the limited storage capacity of SSD-based notebooks forces them to pick and choose what files to bring from their library," said Matt Rutledge, vice president and general manager for WD client storage products. "With the release of the new WD Scorpio Blue 7 mm mobile hard drives, WD is able to offer capacity, reliability and data-protection features combined with excellent power management all in a slim form factor perfect for thin and light notebooks." Low power consumption - Advanced power management features and algorithms optimize the way the drive seeks data, which significantly improves power consumption. Shock Tolerance – WD's ShockGuard™ technology, now increased to a best-in-market 400Gs shock specification, protects the drive mechanics and platter surfaces from shocks. Cool and quiet - In a notebook drive, silence is golden. WD's exclusive WhisperDrive™ technology enables quiet performance. Compatibility Tested - WD performs tests on hundreds of systems and a multitude of platforms in its FIT Lab™ and Mobile Compatibility Lab to give customers confidence that drives will work in specific systems. Shipping now through select distributors and resellers, the WD Scorpio Blue 7 mm 2.5-inch mobile hard drives are covered by a two-year limited warranty. 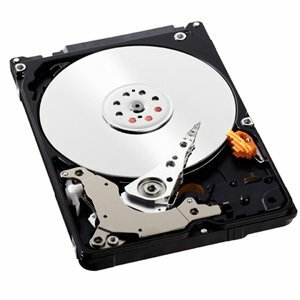 MSRP for the 500 GB, model #: WD5000LPVT is $99.99 USD and the 320 GB, model #: WD3200LPVT is $79.99 USD.